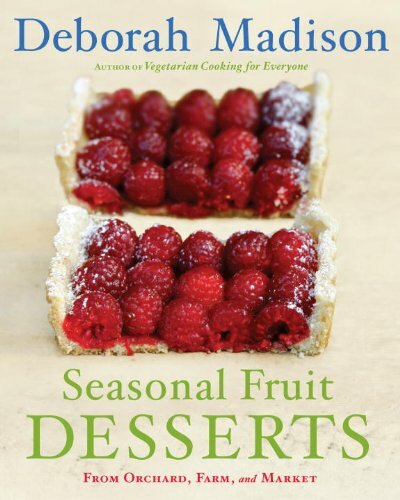 The Seasonal Produce Poster provides a detailed list of the fruits and vegetables in season each month according to local farmers and seasonal harvest guides based in the Bay Area, and California's West Coast. 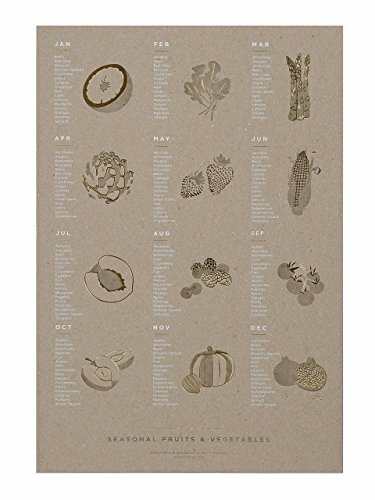 Foil-pressed 13 x 19 kitchen poster on .035 natural recycled chipboard with three foil colors: clear, white and gold. Printed by the 100-year-old local press, The Ligature in Berkeley, CA. 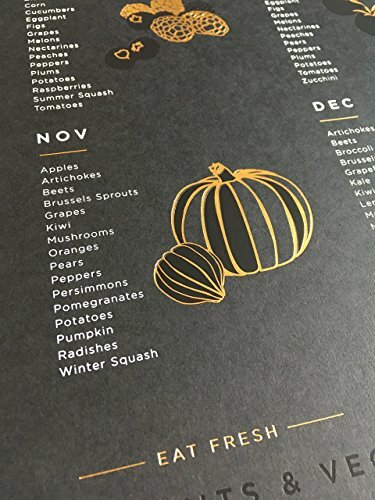 The Seasonal Produce Poster provides a detailed list of the fruits and vegetables in season each month according to local farmers and seasonal harvest guides based in the Bay Area, and California's West Coast. Foil-pressed 13 x 19 kitchen poster on Colorplan's Claret 350 gm / 130# coverstock, with three foil colors: clear, white and gold. Printed by the 50-year-old local press, The Ligature in Berkeley, CA. 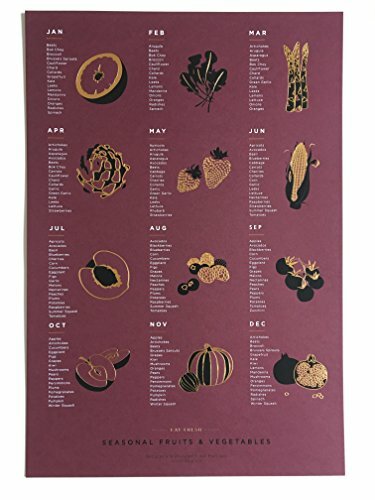 The Seasonal Produce Poster provides a detailed list of the fruits and vegetables in season each month according to local farmers and seasonal harvest guides based in the Bay Area, and California's West Coast. Foil-pressed 13 x 19 kitchen poster on Colorplan's Ebony (Black) 350 gm / 130# coverstock, with three foil colors: clear, white and gold. Printed by the 50-year-old local press, The Ligature in Berkeley, CA. 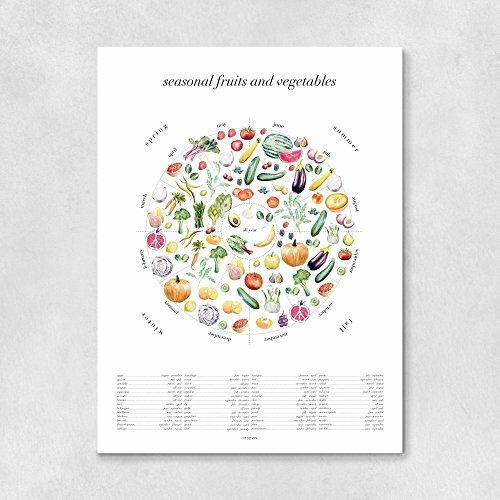 This beautifully abundant wheel of seasonal fruits and vegetables is the perfect way to decorate your kitchen and keep you up to date with seasonal produce. Each food item is hand-painted then digitally arranged into the final design. Please note that this chart is based on seasonality of the Northern Hemisphere. • Made to order • Free Shipping on all orders • Size: 18 x 24 in (check out our other listings for other sizes) • Printed on archival, acid-free, 192 gsm matte museum-quality paper • Frames not included • Colors may vary slightly due to your own personal monitor settings Thank you for visiting Modvin and please don't hesitate to contact us with any questions! 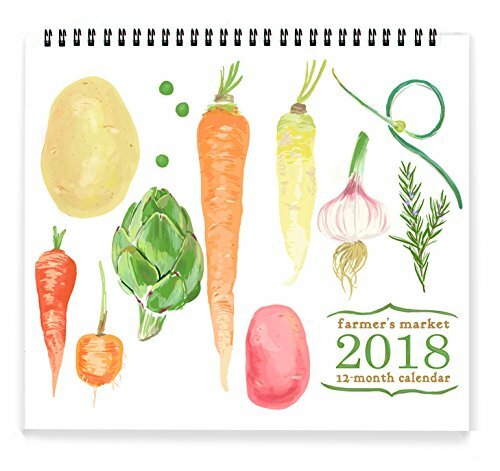 This delicious 2018 wall calendar from Rigel Stuhmiller brings you a full year of illustrations of fresh, local produce. 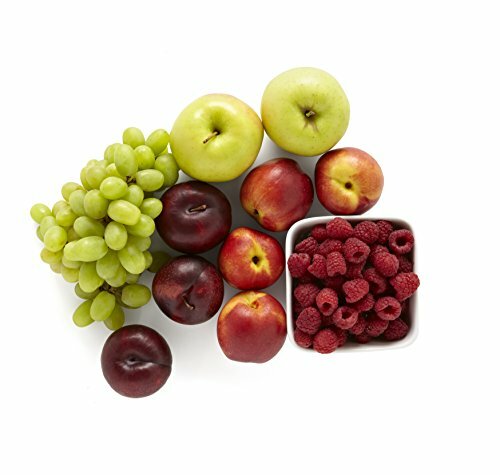 Each month's image features a grouping of the fruits and vegetables inspired by the renowned Chino Nojo produce farm in San Diego, California. Each image is drawn from life and artfully arranged. Perfect for kitchens. Eco-Friendly 100% recycled paper. Designed, printed, and assembled in the USA. 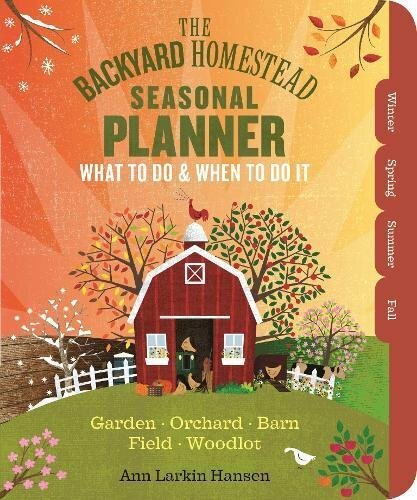 BONUS: When the year is over, trim around the design to get twelve frame-able 10" x 8" images to enjoy for years to come. When trimmed, fits standard frames and mats. 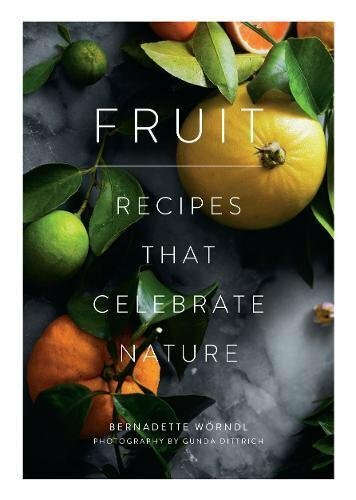 This beautiful and abundant wheel of seasonal, fresh fruits and vegetables is the perfect way to decorate your kitchen and to keep you up to date with seasonal produce. Based on seasonality of the northern hemisphere. • Made to order • Free Shipping on all orders • Size: 16 x 20 in (check out our other listings for other sizes) • Printed on archival, acid-free, 192 gsm matte museum-quality paper • Frames not included • Colors may vary slightly due to your own personal monitor settings Thank you for visiting Modvin and please don't hesitate to contact us with any questions!